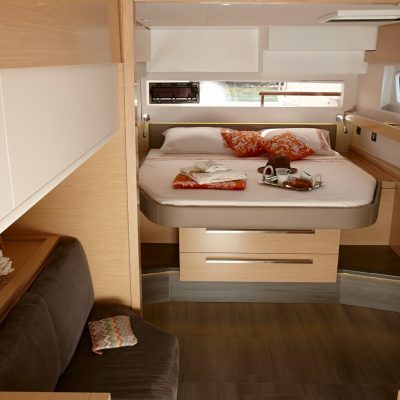 Unrivalled living space, intelligent design and dynamic performance. 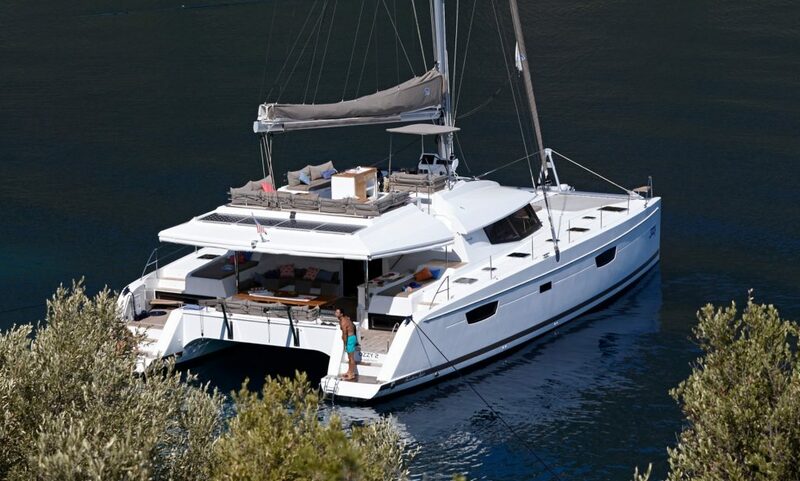 The colossal Ipanema 58 is an impressive catamaran in every ­respect. 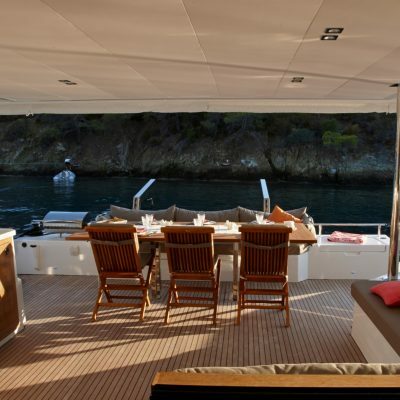 A fabulous outlook from the fly-bridge, luxurious accommodation below and excellent sailing performance, she has it all. 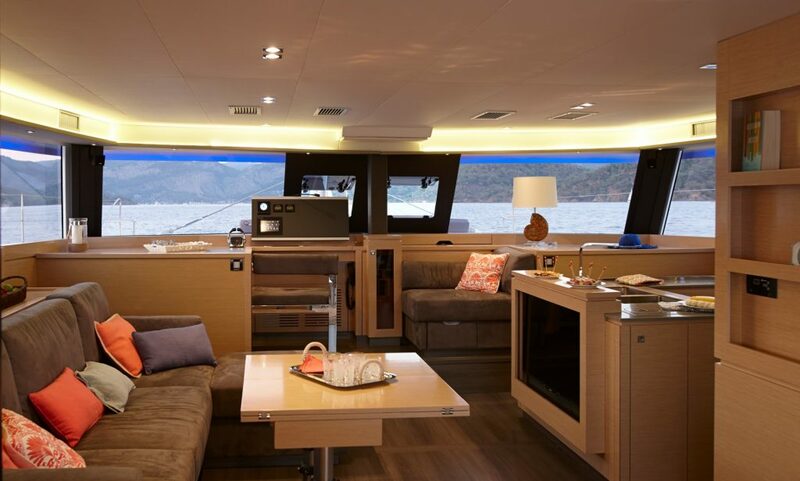 Unrivaled living space, intelligent design and dynamic performance the Ipanema 58 delivers luxury cruising experience without compromise. 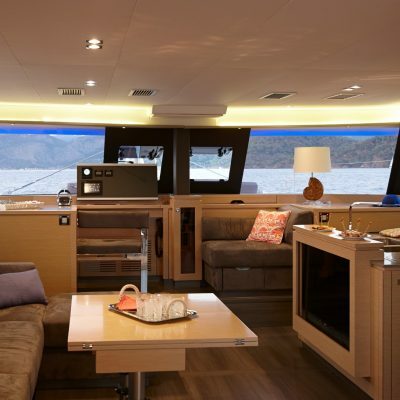 The largest fly-bridge or ‘Sky lounge’ on the market, with dual access points and magnificent 360-degree outlook. Luxuriously appointed interior, contemporary fixtures, and choice of innovative layouts, including an epicurean galley connected to the spacious saloon or a true Lounge version. 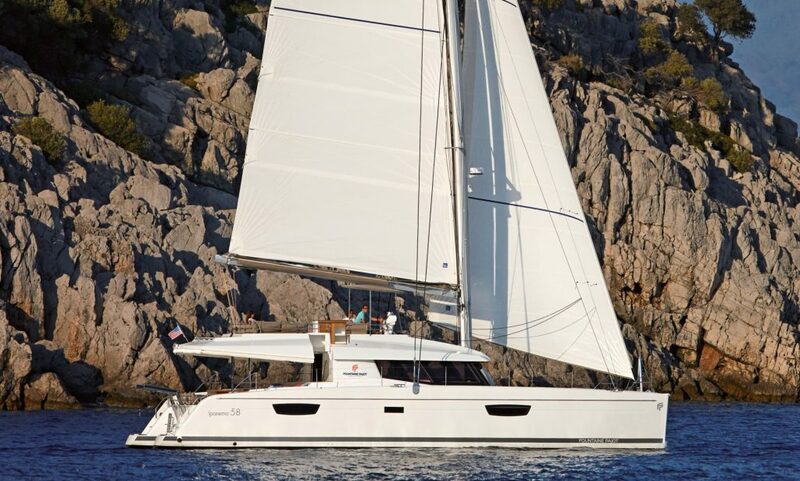 Powerful, easy to handle sails coupled with finer entry bows give better performance on all points of sailing. 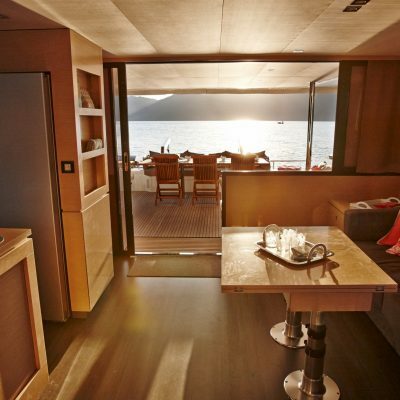 Four, five or six en-suite double-cabins make the Ipanema 58 the most capacious in her class. 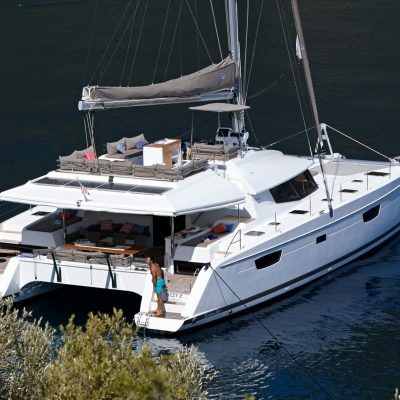 Or please scroll down to read more about this magnificent catamaran. 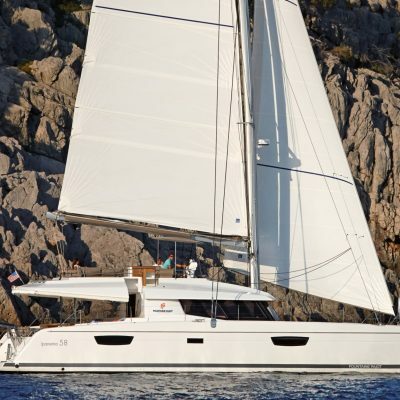 The Ipanema 58 is a boat designed to enjoy sailing and the lifestyle in great comfort and style. 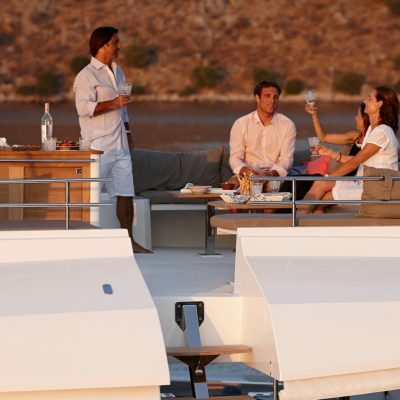 The exterior entertainment areas are spacious and comfortable. 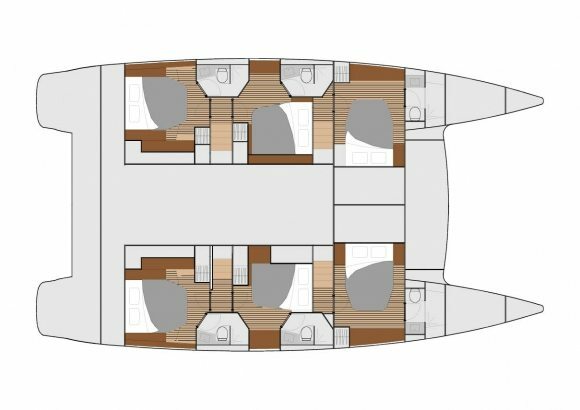 The transom features wide sugar scoops and an electronic tender-lift option which doubles as a huge bathing platform when the dinghy is launched. 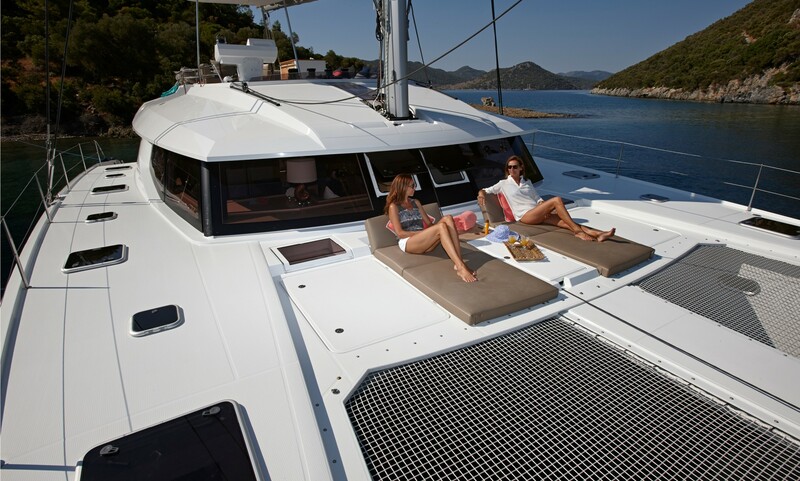 A massive foredeck, with folding backrest sunbeds and a huge trampoline, is ideal for sun-worshippers to relax on underway. The vast cockpit is simply enormous at 225 ft². 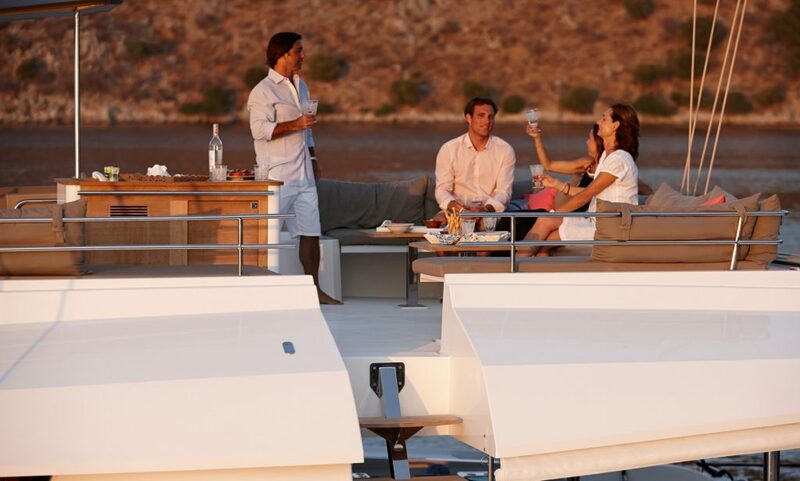 The folding cockpit table is set towards the stern but also rotated horizontally across the width of the boat. 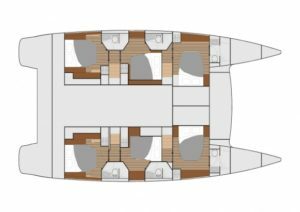 Using the aft bench seat and directors chairs, when folded it is neat and seats 6, but extended will easily seat 10. 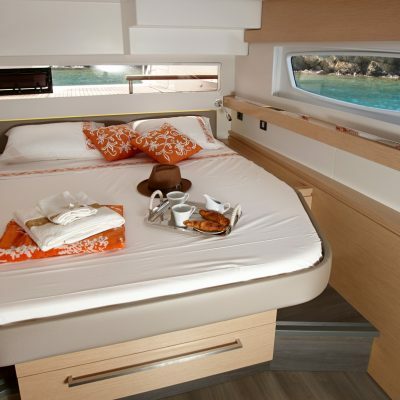 Just forward of this to port is a large L shaped settee and above this to the side a sun-bed. 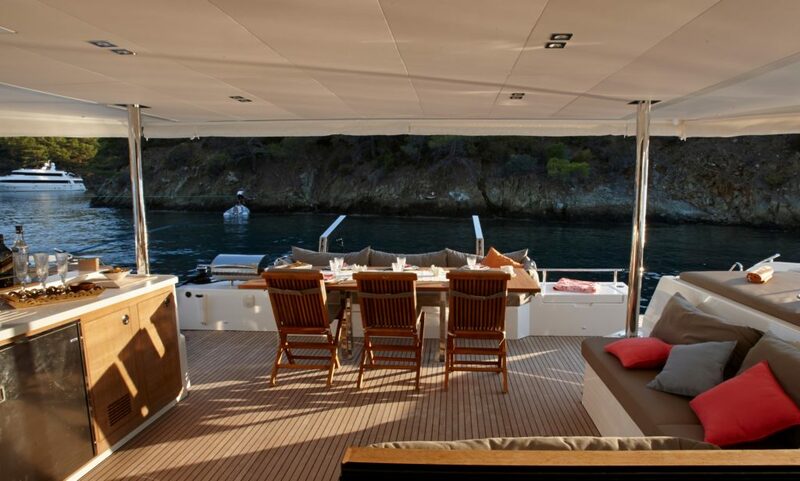 To starboard, there is another sun-bed set outboard and steps up to the fly-bridge, a bar and double fridge complete this exquisite area. 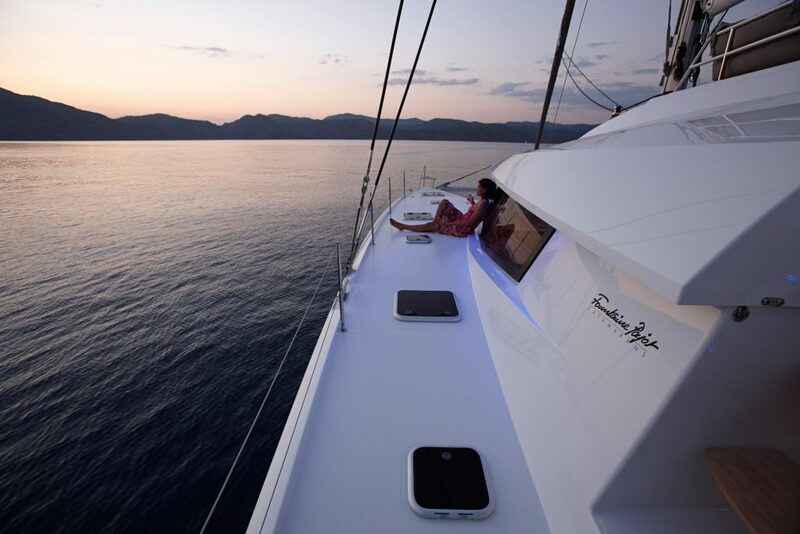 The upper deck ‘Sky Lounge’ as it is known, is like everything else on this boat, big. There are two entrances from each side and wrap around seating for 10 or more. 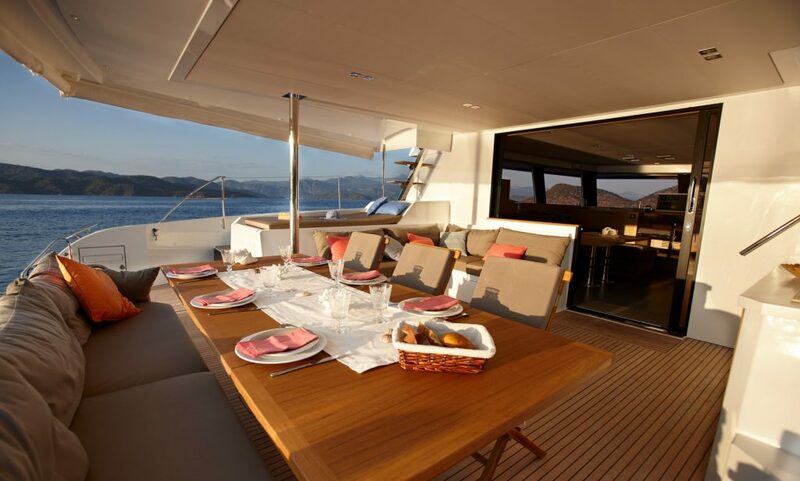 There are two separate coffee/drinks tables with plenty of walk-around space. 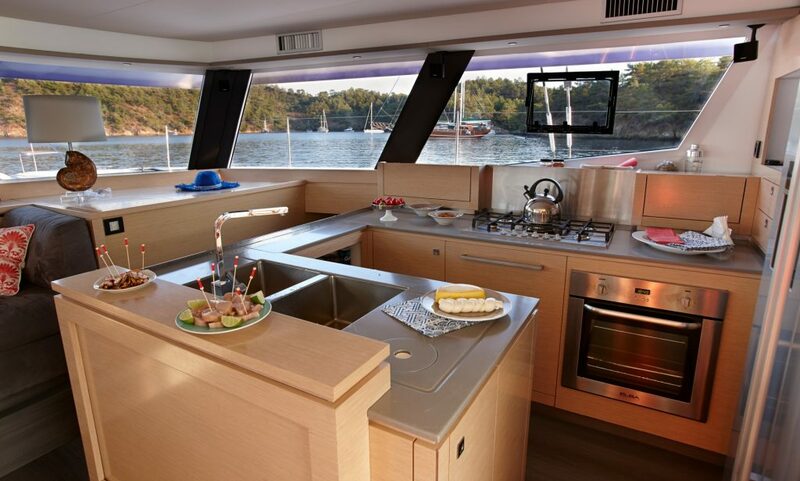 And there is an island with handholds, storage, and a sink. It is very very impressive. 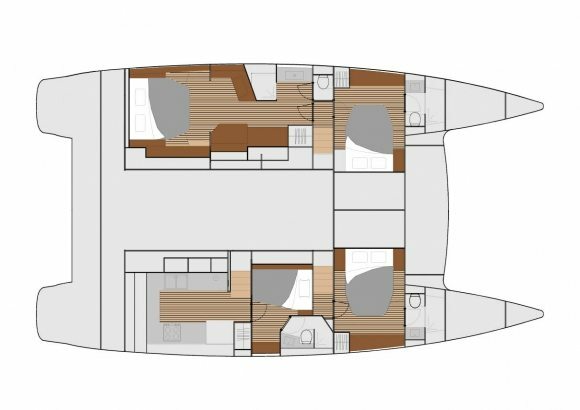 Through a large sliding door and a sliding window, you find an open plan saloon. 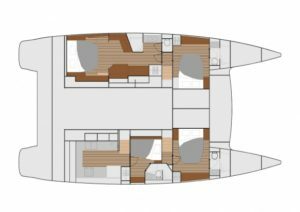 It includes an apartment-size kitchen, full-size appliances, and a big lounge area, as well as a nav station with excellent views in all directions. 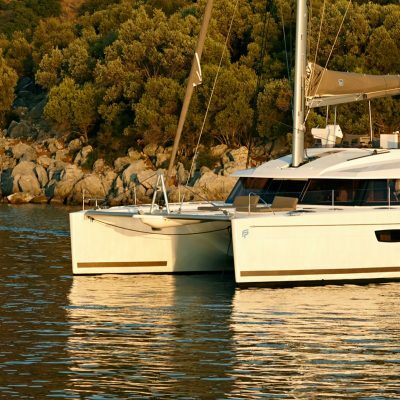 To starboard is the comprehensively equipped galley with double sink, full size fridge and freezer, ice maker plus plenty of countertop and storage. 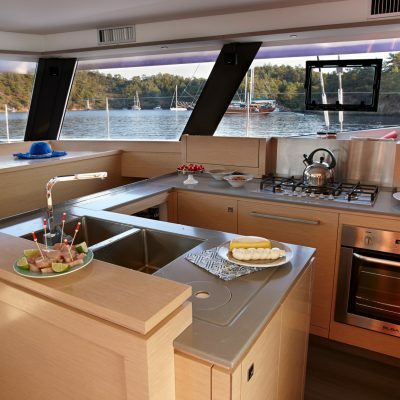 There is a big oven and countertop 5 burner stove. 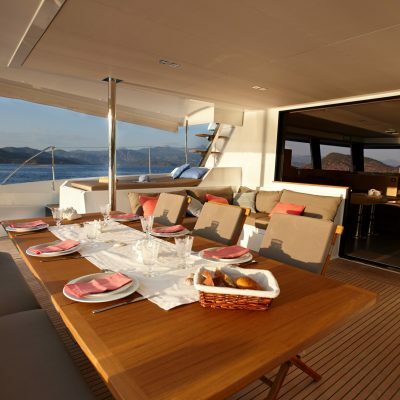 To port there is an extended bench settee and coffee table or dining table depending on the option you select. 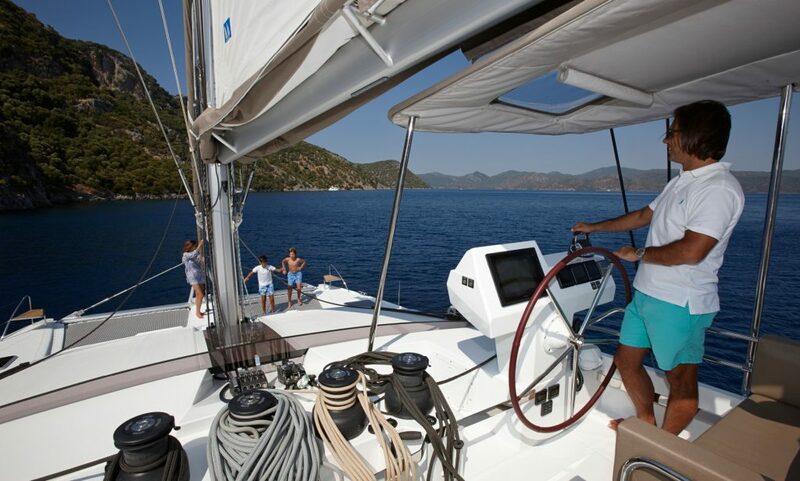 Forward there is a large navigation area with plenty of space for charts and a centrally placed set of electronics for navigation and monitoring the boats systems. 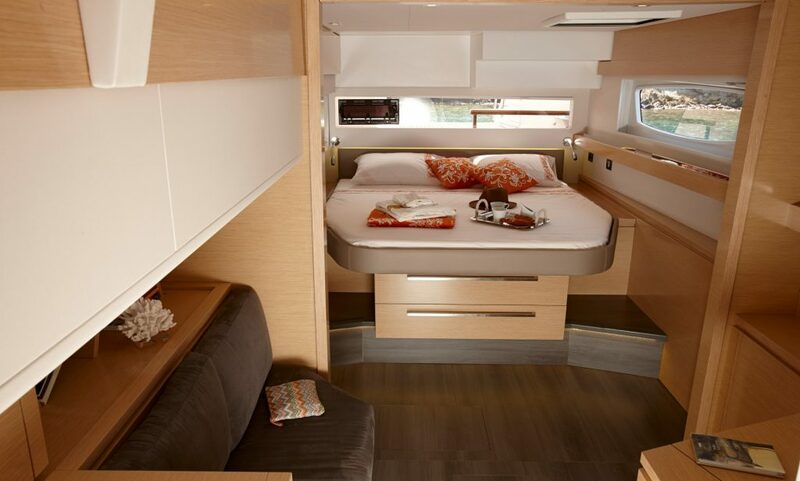 But it’s the feeling of space and openness you get that transcends the layout of the hardware. Natural light from large vertical windows bathes this vast open saloon with exceptional light and gives great visibility out even when sitting. 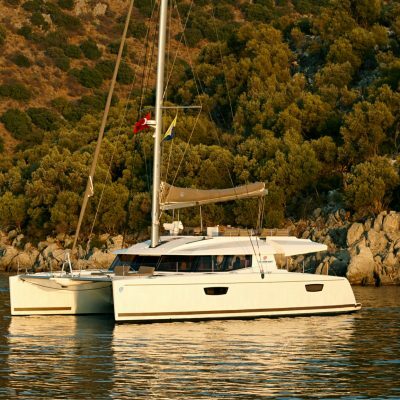 Set forward to port is a forward angled navigation station, again with excellent visibility, and it uses the extended settee as a seat. The whole area has a very open and spacious feel. 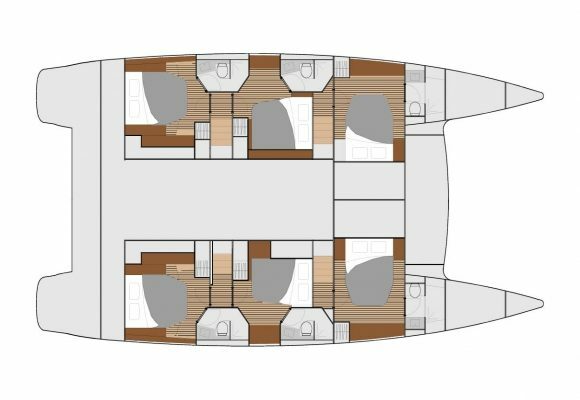 The helm station is a commanding position and is entered up steps from the side deck via the fly-bridge. 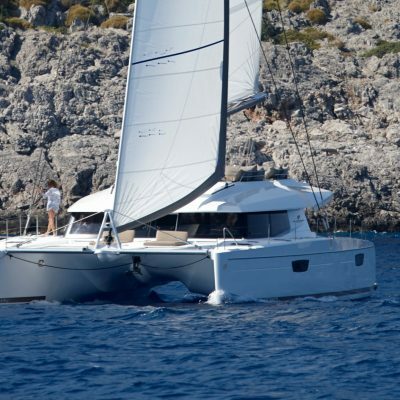 The helm is offset to starboard but gives excellent 360 degree visibility. 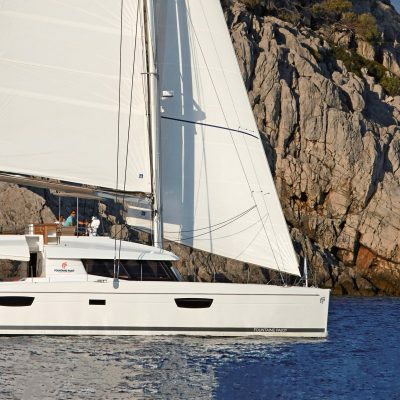 There is a three-person bench seat at the helm with the Navigation equipment, wheel and Volvo engine controls mounted just forward on a pedestal. All running rigging is led to a ‘sail control station’ next to the helm, where there are four big electric winches to make adjustments easily, and plenty of tailing bags to keep excess rope neatly tucked away. Her sailing performance is good. 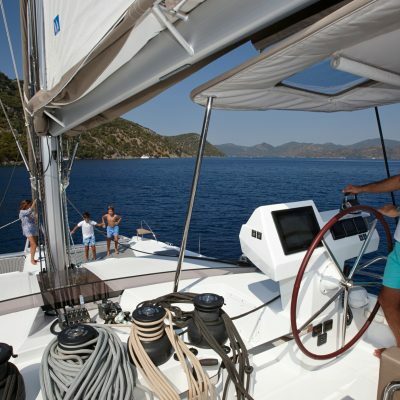 In mid range winds you will see 7-8 knots upwind and 10-12 when eased. 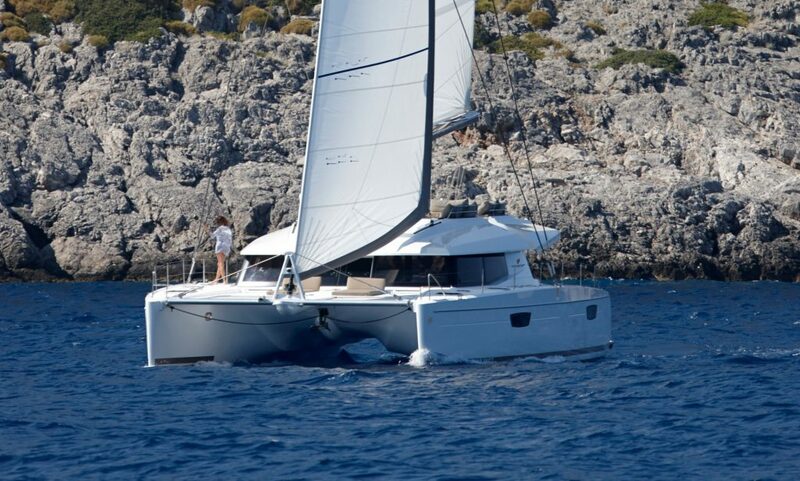 The hull has managed 16knts in some much bigger wind with small sail area, so she definitely performs. 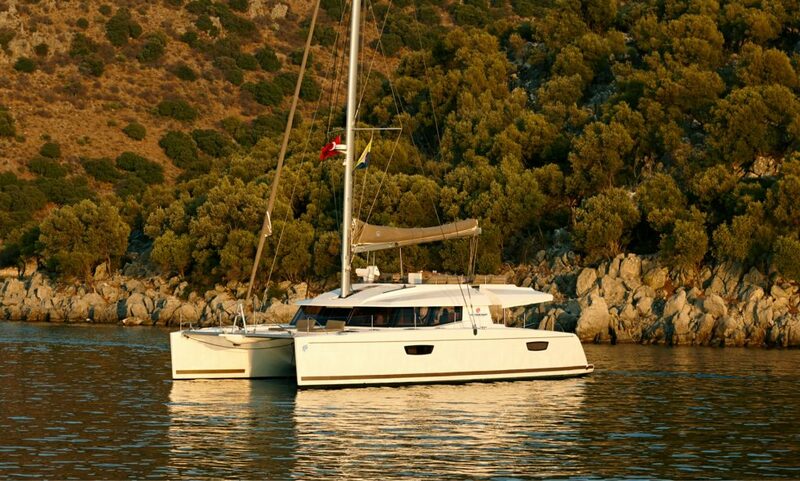 Under power the twin 75HP Yanmars perform well and will spin the boat easily in its own length. At 2,300rpm you should see 8 knots of boat speed and from the fly-bridge you barely hear the engines. 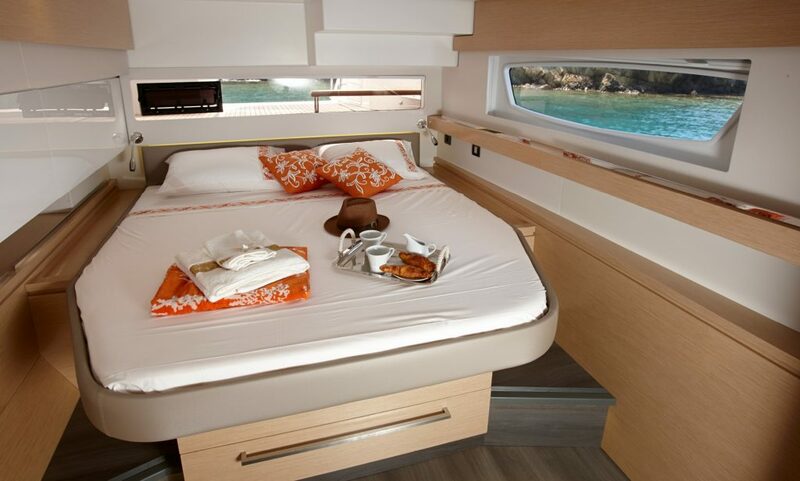 The 6 cabin charter version provides a remarkable amount of privacy for everybody aboard, as well as accommodation for any captain and crew. 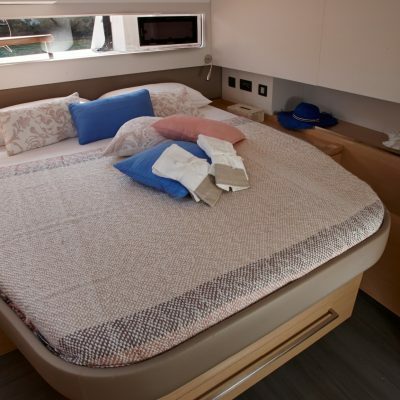 The spacious guest cabins all have private entrances; a freestanding double island berth that is easy to get into; a private head with a separate shower compartment; and adequate stowage space for a week’s charter or longer cruising. 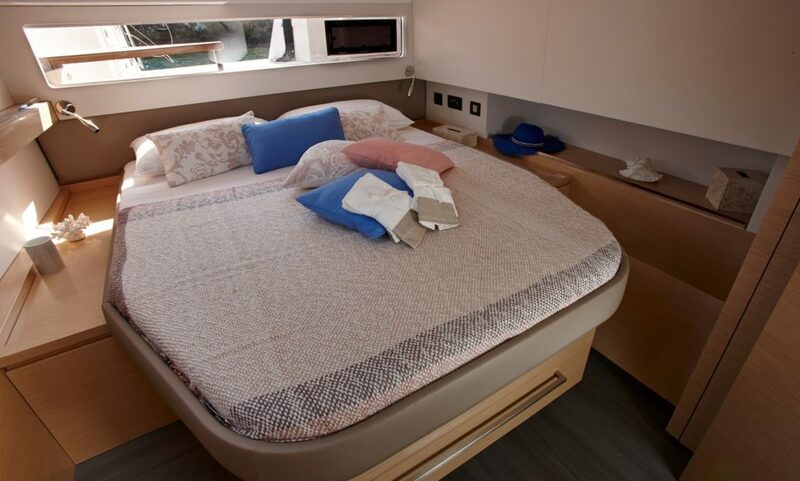 Fountaine Pajot also offers a “Maestro” version, with larger owner’s accommodation and either three or four other private cabins. In this configuration, the galley can be located on the main deck or down in the starboard hull.